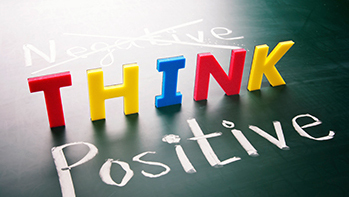 Can Positive Thinking Cure You? Ever hear “you have to stay positive when you’re sick,” implying that positive thinking can make you better? Me too, a lot in fact. As a kid in the hospital, I heard that one plenty, so I wanted to investigate. Can positive thinking improve one’s physical health? Does the condition matter? Does stress come into the equation? 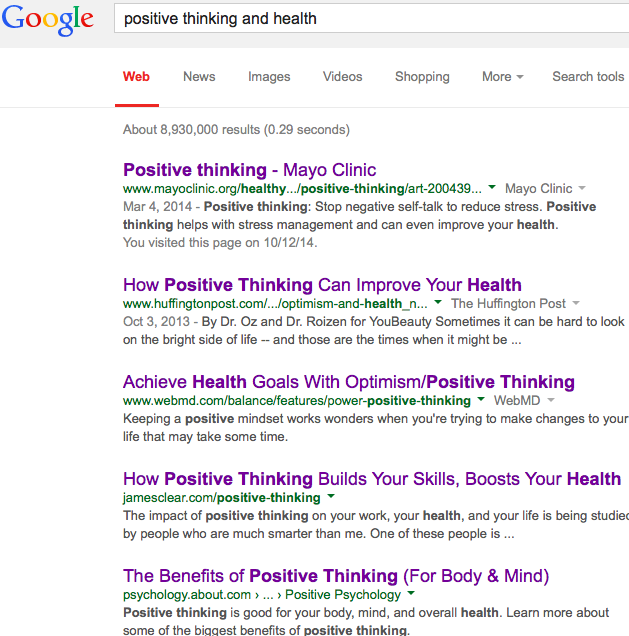 First, I looked into studies that claimed positive thinking as a health benefit. Study #1: Over five years, Steven Greer and his colleagues followed the physical and psychological conditions of 578 women who had enrolled in the study with early-stage breast cancer. Early on they classified women in “helplessness/hopelessness” or “fighting spirit” categories based on their answers to surveys. At the end, women with high “helpless/hopeless” scores were more likely to relapse or die within five years than women with a “fighting spirit.” Study #2: Next, men undergoing coronary artery bypass graft surgery were interviewed before the surgery, a few days after surgery, and then again months later. Researchers used the LOT (Life Orientation Test) to convert people’s statements about their expectations for their future health to scores to evaluate optimism. Men classified as “optimists” had fewer negative physiological changes in their electrocardiograms and fewer releases of enzymes into the bloodstream that could cause infections. Basically, the data showed that pessimists were more likely to suffer heart attacks during surgery. Pessimism also seemed to be related to slower recovery. Study #3: In 2001 researchers found that amongst war veterans, veterans determined by personality inventories to be optimists were less likely to develop heart disease than the veterans classified as pessimists. The researchers determined this result was independent (meaning not affected by) smoking habits. In fact, further studies have found no significant data demonstrating that positive thinking improves health. The meta-analysis called “Positive Psychology in Cancer Care: Bad Science…,” reviewed 12 studies that examined the effect of “fighting spirit” on cancer progression and survival. The ten larger studies found negative results, and only the two smaller, flawed, and confounded studies found results that supported the claim that positivity improves health. They cite another meta-analysis that says positive thinking has no significant improvement effect on cardiovascular diseases or cancer. The American Cancer Society even discounts the health benefits of positive thinking. How can we explain the results of the three studies and many others that say there is a link? First: most studies have a potential reverse causality—instead of positive thinking improving a person’s health, a person who becomes healthier could improve their attitude. Potential confounding variables (like lower SES and education) and small sample size influenced other results. In “Thinking differently about thinking positive,” Sue Wilkinson and Celia Kitzinger pointed out that especially in the world of breast cancer, patients feel a lot of pressure to think positively, which could coerce subjects to report more positivity than they actually feel. The questionnaires and surveys themselves can also be ambiguous, and the coding of patients’ answers is inconsistent. In one study the phrase “I try to see it in a different light, to make it seem more positive” was coded as positive thinking while “It’s best to be positive at all times. I try not to let myself get depressed, sad, or angry when things go wrong” was coded as the less positive “Type C personality” that allegedly increased risk of cancer. Inconsistent modes of measurement of positivity mean that the results are not reliable. Some also thought that stress influenced the results of conditions like heart disease and Alzheimer’s that are connected to stress. But data shows positive people are not necessarily less stressed than negative people, nor do coping methods of stress (good vs. bad) make a significant difference in physical health. So why do some still believe that positive thinking cures? Here’s my thought: when I was in the hospital as a kid, I liked to think that if I behaved and stayed positive I would get better. When facing terrifying illnesses, people want to do something, doctors want to as well, and the idea that positive thinking could help is comforting and within someone’s control. There might be perceptual bias like that of the doctors mentioned in class: Believers of positivity may think if they get healthier, it’s because they were positive, and if they don’t, it’s because the disease was really tough. All of that is understandable, I’ve been there, and no one likes to feel helpless. But the ACS sums it up well: Positive thinking therapy may improve quality of life, but it doesn’t prevent or cure disease. Take home message is wishing doesn’t make it so. This entry was posted in Uncategorized and tagged benefits, cancer, health, heart disease, positive thinking, sick on October 19, 2014 by Abigail Kennedy. Yoga has been around for a while and I’ve done a little here and there. However, up until this summer, my knowledge of yoga was little to none. My friends begged me all winter long to go to class with them at the local studio in my town but the straw that broke my back and forced me to go was my best friend’s mother. She took my mom and I to the “Hot Yoga Spot,” a studio about five minutes from my house, specializing in hot yoga. I got into it quickly and started taking classes four times a week and started referring all of my friends to yoga. It also helped that I think yoga clothes are super cute and I love the way it makes me feel. Hot yoga is a general umbrella of classes but can refer to different types of heated yoga classes, postures, temperatures and tempos. This brings me to my first point. I’m clearly no scientist, hence why I’m taking this class, and I’m also not a yoga expert because I just started a few months ago. If you’ve never heard of hot yoga, it’s basically a yoga class in a heated room. One might not think that yoga is a hard form of exercise, but believe me, after about ten minutes in class, you will be sweating from places you didn’t know existed. I know as a non-scientist, there are benefits to sweating a lot, I’m just not sure what. I also know that yoga makes you more flexible, and the heat helps muscles become more bendy and work better. Heat is also why we are encouraged to stretch and do other exercises after building up our heat rate, when we’re sweaty. From my experience, doing yoga in a heated room increases the intensity of the workout and your overall heart rate, making it harder than normal yoga. Yoga also has a tendency to make you happy. After leaving yoga class, I always have peace of mind, a feeling I encourage everyone to search for. Hot yoga creates an emptiness in the mind even more than non-heated classes because all I think about is the heat and the poses. But that’s just me. I know that there are more benefits, but as I said, I’m no expert, so I had to look online for some information. Although gym rats and lots of athletes I know bash on yoga, it really does help improve strength. Yoga doesn’t feel like running five miles or doing squats but I swear, holding “warrior 2” for more than a few seconds is one of the hardest thing in the world. Yoga tends to tone your body instead of building bulky muscles. Poses that cause you contract muscles and use balance, combined with the heat have been shown to have the same effects on heart rate as running or any other cardio activity. In fact, according to Yoganonymous, a 90 minute class of hot yoga can burn up to 1,000 calories. Another benefit is the detox that comes with sweating and twisting. Sweating in large amounts releases toxins through the skin that would otherwise be in our bodies. I’ve learned that certain poses, which your body doesn’t normally twist into, help to stretch out your organs and make them function better. Each pose has its own organ benefits, due to the massaging of the organs in positions you wouldn’t normally be in. Hot yoga has the benefit of strengthening essential body parts such as the spine and injury prone spots to prevent these happenings. It’s been proven to be good for arthritis patients, sufferers of carpal tunnel, and people nursing joint injuries. Honestly hot yoga has the power to just make you feel awesome. No other activity is as fun for me or has to power to make me feel as good. I’m able to focus on something so intensely for an hour a day that I forget about all the stresses of my life. Plus, the best at my studio at home is at the end when you’re in the final pose, “Savasana,” the instructors walk around with cooled towels infused with mint extract. I also love seeing progress in my yoga practice, between weeks of classes, and just in a single class itself. “Downward Facing Dog” becomes ten times easier from the beginning to the end of class. The moral of this blog post is to go to hot yoga, or at the minimum, regular yoga! Remember, when attending hot yoga, make sure you drink plenty of fluids continually throughout the day, get energy from healthy foods, and definitely bring a towel to wipe up your sweat. Although unlikely, if any of you ever end up in the Capital District in New York and are looking for a yoga studio, go to the Hot Yoga Spot— it’s the best!